Immerse yourself in the cultural diversity of Southeast Asia filled with mysteries and myths from its ancient history. Never be bored with its bustling markets, sprawling cities and cutting-edge modernity. Laze on a beautiful beach in Thailand or enjoy a great night out in the modern Singapore. Singapore a bustling cosmopolitan city that offers a world-class living environment, with her landscape populated by high-rise buildings and gardens. Its ubiquitous collage of cultures, where people of different ethnicities and beliefs coexist. Besides a vibrant multicultural experience, there’s more you can discover about Singapore. 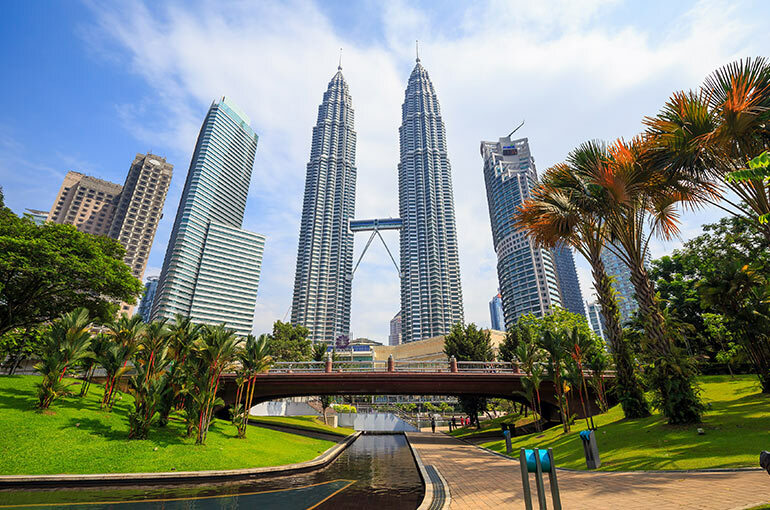 Kuala Lumpur (KL) is the federal capital and the largest city in Malaysia. Literally meaning 'muddy river confluence' in Malay. It is a cultural melting pot with some of the world's cheapest 5-star hotels, cheap, great shopping, even better food and some of nature's wonders in just an hour away, this dynamic city has much to offer for every visitor. Malacca is one of the state in Malaysia, on the west coast peninsular. Visiting Malacca is a unique experience, with a rich historical and cultural background from previous Portuguese, Dutch and British rule. Tourist attractions are mostly concentrated in its small city centre which encompasses Jonker Walk which houses Malacca's traditional Chinatown that exhibits Peranakan architecture. The city centre was listed by UNESCO as a World Heritage Site in July 2008. Penang is one of the state in Malaysia, on the north-west coast peninsular. The island's has a rich multicultural history which is full of Malay, Chinese, Indian and European influences. Penang is also well known for being the 'food paradise' of Malaysia. One of the Island in Penang is George Town, the capital of Penang, popular among tourist which houses many attractive pre-Second World War houses and shophouses, as well as 19th century churches, temples. mosques and colonial buildings. George Town was listed by UNESCO as a World Heritage Site in July 2008. Langkawi also officially known as Langkawi the Jewel of Kedah is an archipelago of 104 islands in the Andaman Sea. Langkawi is a duty-free island. 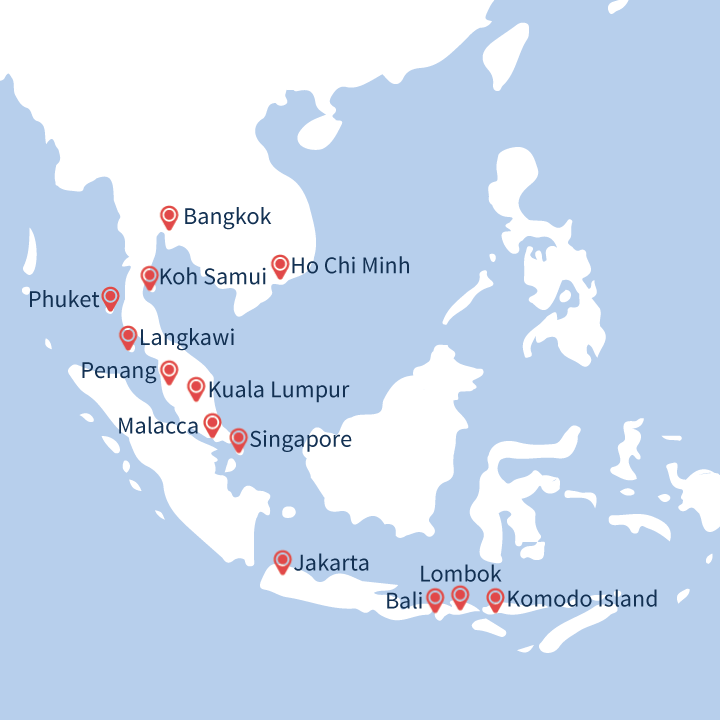 There are a number of popular beaches such as Pantai Cenang, Pantai Tengah, Buraru Bay, Pantai Kok and Datai Bay. Pantai Cenang beach seemingly unending stretches of fine white sand. It houses numerous restaurants and bars for evening entertainment, several hosting live music and for watching sunset. Phuket is one of the southern provinces of Thailand. 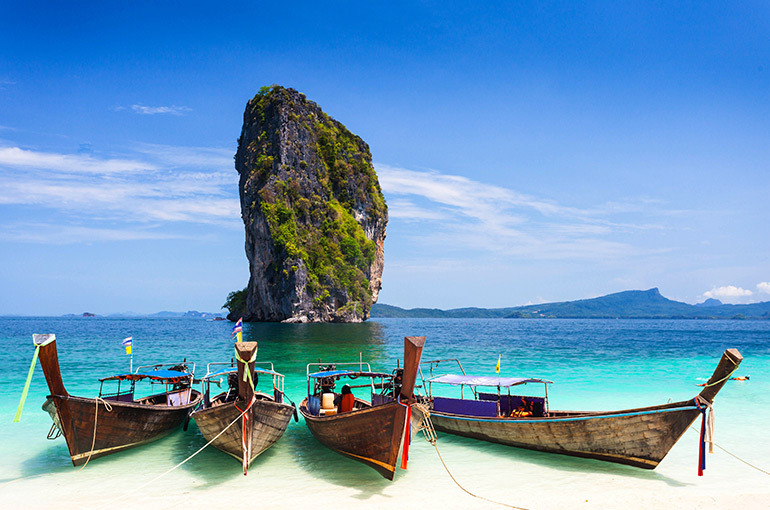 Phuket is Thailand largest island at 48km in length and 21km at its widest. There are lots of activities that are exclusive to do on the island which are swimming, snorkeling, diving, yachting, jet-skiing, parasailing, freediving, windsurfing, kite surfing, wakeboarding and deep sea fishing. Koh Samui is an island located in the Chumphon Archipelago in the Gulf of Thailand, some 700km south of Bangkok and about 80km from the eastern coastline of Southern Thailand. Having vast white sandy beaches, coral reefs and coconut trees on the island. Koh Samui is Thailand second largest island where there are lots of resorts, bungalows and luxury private villas for tourist to stay in during their holiday. Ho Chi Minh City is the largest city in Vietnam and the former capital of the Republic of Vietnam (South Vietnam). It was previously named 'Saigon' until after the fall of Saigon in 1975, the 'Saigon' is still widely use by both Vietnamese and foreigners, especially referring to the most central part of the city where tourists flock. There are lots historical sites, religious sites, architectural attractions to see and shopping to do at the local markets. Bangkok is the capital and the most populous city with over eleven million inhabitants of Thailand. It has one of Asia's most cosmopolitan cities with magnificent temples and palaces, authentic canals, busy markets and a vibrant nightlife that has something for everyone. It also offers wide range of choices for shopping and dining experiences that tourist will be spoilt for choice. Jakarta is the capital and the largest city of Indonesia which is located on the northwest of the island of Java. It is also the most populous city not only in Indonesia but in Southeast Asia as a whole. It is filled with an exciting nightlife and vibrant shopping areas. There are many attractions such as monuments, landmarks and museums around Merdeka square and Jakarta Old Town. Bali, the farmed Island of the Gods, with its varied landscape of hills and mountains, rugged coastlines and sandy beaches, lush rice terraces and barren volcanic hillsides all providing a picturesque backdrop to its colourful, deeply, spiritual and unique culture. Bali is one of the world's most popular island destinations and one which consistently wins travel awards, it has something to offer a very broad market of visitors from young back-packers through to the super-rich. Lombok is an island in the West Nusa Tenggara province of Indonesia. It is part of the chain of the Lesser Sunda Islands, with the Lombok Strait separating it from Bali to the west and the Alas Strait between it and Sumbawa to the east. There are a number of things to do when you are at Lombok such as traditional massage, snorkeling, surfing, scuba diving, trekking, fishing charters, biking tours, pearls shopping, cooking classes. Komodo is one of the 17508 island that compose the Republic of Indonesia. The island is particularly notable as the habitat of the Komodo dragon, the largest lizard on Earth. There are a number of things to do when you at Komodo Islands such as kanawa Island diving, komodo liveaboards, komodo kayaking, sea kayaking, wicked diving, flores spa and blue marlin dive komodo. One of Vietnam's most popular seaside resorts, Nha Trang offers white-sand beaches, azure waters and palm trees swaying in the breeze. Gaily painted fishing boats line the harbours. Small farm villages nestle in the countryside's lush valleys. Yet this relaxed city of some 300,000 souls boasts a long and storied past. Nha Trang was the capital of the Champa Kingdom, which dominated this corner of Southeast Asia for 13 centuries. North of the city, the great Cham Tower complex overlooks the Cai River and offers mute testimony to the kingdom's glory. Today, the towers attract locals and visitors alike, many of whom come to meditate while contemplating superb views of the river and the bay. Nha Trang's tourist district consists of a scattering of colonial-era beachfront hotels and sidewalk cafes. The city was a popular spot for U.S. servicemen during the Vietnam War. Nothing can prepare you for the beauty of Ha Long Bay and its 2,000 limestone karsts, nor the experience of trekking around mountainous Sapa. Designated a UNESCO World Heritage Site in 1994, this port city with its sweeping lush landscapes and calm waters lies just 100 miles from the bustling streets of Hanoi. Catch a water taxi out to one of the many floating restaurants on the bay. There’s so much to explore on a Vietnam cruise. Head to Hanoi, the country’s captivating capital, where you’ll find a blend of Parisian grace and Asian pace. Rise early to watch t’ai chi practiced at dawn near Hoan Kiem Lake, then take in the rich heritage and history with a visit to the Ho Chi Minh Mausoleum and the bustling back streets of the Old Quarter. Or embark on an adventure through the Red River Delta. Experience one of the world’s most magnificent natural wonders- Ha Long Bay in the Gulf of Tonkin from the decks of a traditional Chinese junk boat. The Nguyen Dynasty founded this former capital in the 17th century on the banks of the Perfume River. Today it sits as a massive open-air museum of temples, pagodas, palaces and tombs. Explore the Imperial Citadel, then take a river cruise for a view of the Tombs of the Emperors and Thien Mu Pagoda. Pago Pago is the main settlement on Tutuila, surrounded by peaks rising out of deep water harbor rimmed with palm-shaded beaches.